Pruning bamboo plants enables the rhizomes to be stopped from running out of control. Controlling bamboo involves cutting the escaping rhizomes with shears or with a straight-bladed shovel. In September or October you can easily carry out this yearly rhizome pruning by cutting a line around the area where you want the bamboo to remain with a shovel. The theory behind root pruning is that the current year's rhizome growth can't exist on its own. Some young rhizomes (current year's growth) may not need to be dug out afterwards as they will not survive without the parent plant. However, older rhizomes will continue to sprout on their own and it would be best to remove them at pruning time when it is easier. Of most species, the rhizomes are not very far beneath the surface of the soil so there isn't a lot of digging to do for this operation. They are usually no more than 1 foot below the ground, the depth of a spade, and using this method twice a year is generally sufficient to curb growth back to where you want it. Another method of pruning bamboo and to ease rhizome trimming is to dig a narrow trench around your stand and check it once a year to see if any rhizomes have tried to cross it. You may also find control and containment through the use of rhizome barriers of interest. 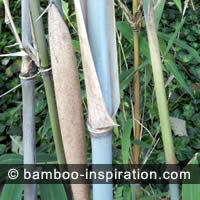 Pruning bamboo by removing any erratic growth along with dead, damaged, small, and old unattractive canes once a year. This leaves space for the better quality culms to get fatter and taller. Image: The old small canes can be pruned to ground level. 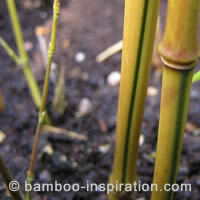 Bamboo culms only live to approximately 15 years and pruning bamboo yearly does the plant good. If you make the cuts just above the node the stub will not die back and leave a dead unsightly stump. Trim your stand to make it look attractive and to fit in with your garden design. For example, when a stand is a few years old, cutting off the lower leaves to about 5 feet can make for a striking effect. This is a particularly good method of displaying colourful species such as Phyllostachys vivax ‘Aureocaulis’, Phyllostachys nigra, and Phyllostachys bambusoides ‘Castillonis’. The beauty of these plants can be enhanced by removing smaller canes and cutting off lower branches so that the culms are visible. Don't worry about damaging it... it is very tough. The brown culm in this stand can be pruned out. It is old juvenile growth. Bamboo also makes a good windbreak, screen or hedge and can be cut or trimmed in the same way as you would do with traditional hedging plants such as boxwood. The best time to do this is once a year, in spring or summer, after the new culms have grown to full height. You can carry out minor trimming at other times of the year but only do one major pruning. To control the height and culms diameter of your bamboo screen or hedge, remove new bamboo shoots that have a larger diameter than the culms that are already the desired size. The shoots you remove will be replaced with culms that are smaller in diameter and that won't grow so tall. Don't do this with a newly planted stand, but it can be safely carried out on a well established plant. In the case of dwarf bamboo, it is said that cutting it to the ground in the spring enables rejuvenation. I do not cut all my own down to the ground as I like them as they are, so it’s up to you if you want to use this method. When the new growth emerges it should be denser and shorter and will look much more attractive as ground cover but I recommend trying pruning some of it first as an experiment to see the result, not all at once in the same year. To retain a short and/or uniform height, they are also often trimmed a bit later in the season.